Tripett BUTCHER SHOP features a line of canned food based on pure meat formulations which are 100% GRAIN FREE and 99%+ PURE MEAT and TRIPE. Some formulations are 100% Green Tripe based, others have additional protein sources, ranging from Venison, Duck & Salmon. These products offer unsurpassable palatability and nutrition that dogs simply can't resist! Green tripe is the unbleached, nutrient rich stomach lining of a grass-fed animal containing essential fatty acids and digestive juices important for your pet’s health. *The texture, colour, odour of Tripett products will vary from can to can and case to case. Usually the variations are minor, but sometimes they are significant. The reason for this is due to our formulations based on nearly 100% unbleached, minimally rinsed and unprocessed GREEN TRIPE. "Maizey is a one-year old Havanese. My breeder suggested feeding PetKind food. My dog loves it! She eats Tripett green lamb tripe. She's always finished her bowl and wants more." "We recently bought some of the Petkind wet canned food to add in to our picky eater Diesel's dry food. He LOVES it! Had never heard of this brand til the other day and we will never buy another brand other than this again!" 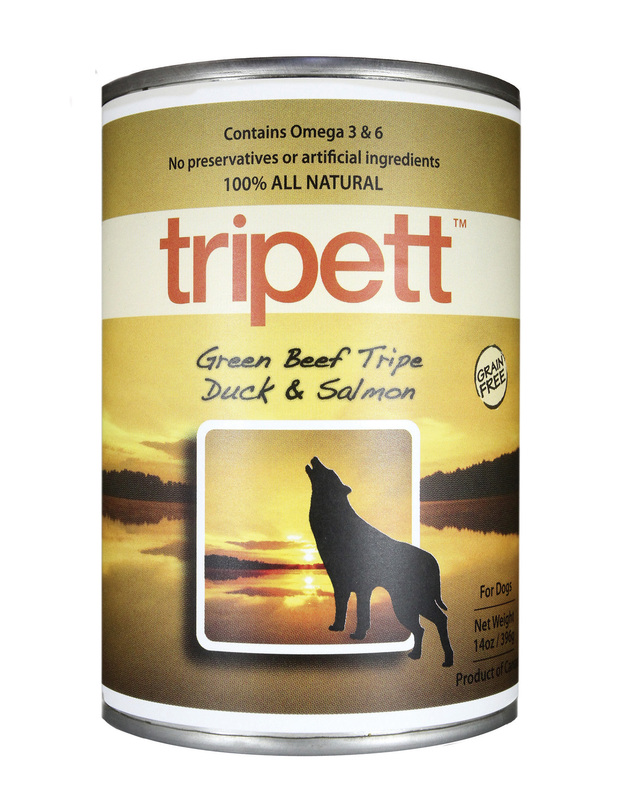 Tripett Original Formula is a grain-free product consisting of nearly 100% green beef tripe. Good for all breeds and all sizes. Tripett. Feed well. Our Original Formula is known for its exceptionally high content of green beef tripe, and mixes nicely with dry and raw food. Tripett New Zealand Green Lamb Tripe is a grain-free product consisting of nearly 100% green New Zealand lamb tripe. Good for all breeds and all sizes. Tripett. Feed well. Our New Zealand Lamb Tripe is known for its exceptionally high content of green lamb tripe, and is often used with puppies during weaning and “moms” pre and post litters. Good for all breeds and all sizes. Tripett Green Beef Tripe, Duck & Salmon is a grain free product consisting of nearly 100% pure meat and tripe (green beef tripe, duck & salmon). Good for all breeds and all sizes. Tripett. Feed well. Duck & Salmon are highly palatable and rich in omega’s 3 & 6. This product is often used as an added boost for skin and coat conditions, and variety of protein. Tripett Green Beef Tripe & Venison is a grain-free product consisting of nearly 100% pure meat and tripe (green beef tripe, venison). Good for all breeds and all sizes. Tripett. Feed well. Venison is high in protein, but low in calories and cholesterol. This product is great for someone looking for all the incredible benefits of green tripe with a diversified protein source. Tripett Green Bison Tripe is a grain-free product consisting of nearly 100% Green Bison Tripe. Good for all breeds and all sizes. Tripett. Feed well. Our green bison tripe is unique alternative to dogs with specific allergies, and mixes nicely with dry and raw food. Tripett Green Venison Tripe is a grain-free product consisting of nearly 100% pure meat and tripe (green venison tripe). Good for all breeds and all sizes. Tripett. Feed well.